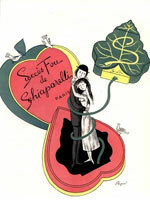 Perfume and fragrance advertisements for Succes Fou by Elsa Schiaparelli. Succès Fou by Elsa Schiaparelli - This fragrance was presented in a leaf-shaped bottle designed by Michel de Brunhoff, Vogue Paris magazine's Editor in Chief, 1929-1954. Succès Fou, French for "Raving Success" or "Smash Hit," was launched only in the USA in 1953. 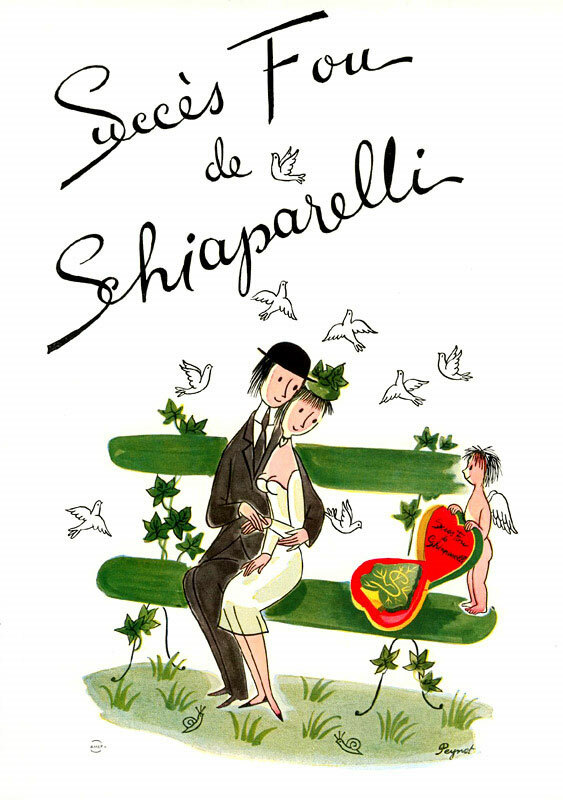 Advertising illustration created by retro French illustrator Raymond Peynet, who created "le amoureaux de Peynet" (the lovers of Peynet) while stationed in the south of France during the war in 1942. The Surrealist lovers were simply drawn and came to symbolize France's fresh start after World War II, and grew in popularity. 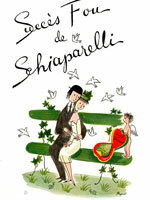 Perfume advertisements for Succes Fou by Elsa Schiaparelli by poet and illustrator, Raymond Peynet.